It has started! Friday was a busy, busy day. Wooden posts were drilled, math skills were tested (I failed miserably) and drop cloths were arranged. 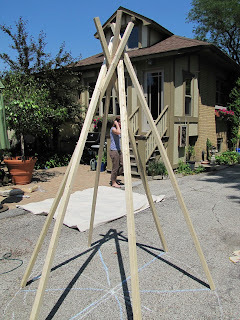 I am going to be honest here, making teepees is MUCH harder than I thought it would be!!! Obviously, that teepee is spectacular! The shape, the fabric, the details! 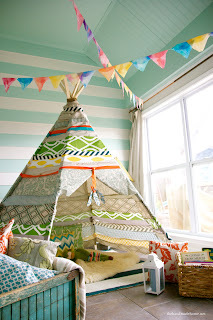 While we love this one, we want to get our children in on the decorating of our teepees. So, we decided to use a drop cloth for the fabric, it was inexpensive and it will be easy for the kiddos to paint. We have set a date for the final arranging and decorating later this week. I promise to share pictures and instructions! But this might be a good time to start brushing up on your math!!! So here it is, the START of something BIG!! !